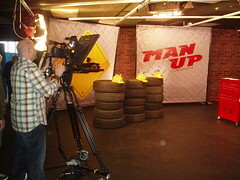 I spent the afternoon watching the taping of Man Up! Canada, a new reality-style game show for guys. It's hosted by Humble Howard Glassman and will eventually air on SUN TV and MenTV. My brother and I were there for about 2.5 hours watching it all come together and appearing in several audience shots. 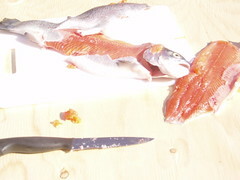 There was a competition where the guys catch goldfish in a pool, slice open a different fish and eat yet another fish without using their hands. That sucker was called Survivor Etobicoke. The next bit involved some trivia and a dunk tank and the final bit was called Pudding Licker. That's all I'm at liberty to say about that one. It was fun and I met some neat peeps. Will Man Up! Canada be the next Amazing Race? Only time will tell. Here are pix from the photoset.